When’s the last time you went away for a week or weekend to relax and explore the mountains? As we continue to move toward a snowy Colorado winter, it’s time to get away from the city and spend some time in mountain country at C Lazy U. C Lazy U is a luxury dude ranch in the beautiful Colorado Rocky Mountains. We host families, friends, and companies all year long, and our long list of activities and events provides fun for everyone. Plan a trip to the resort this winter, and experience what it’s like to sleep, eat, and live on a western ranch. 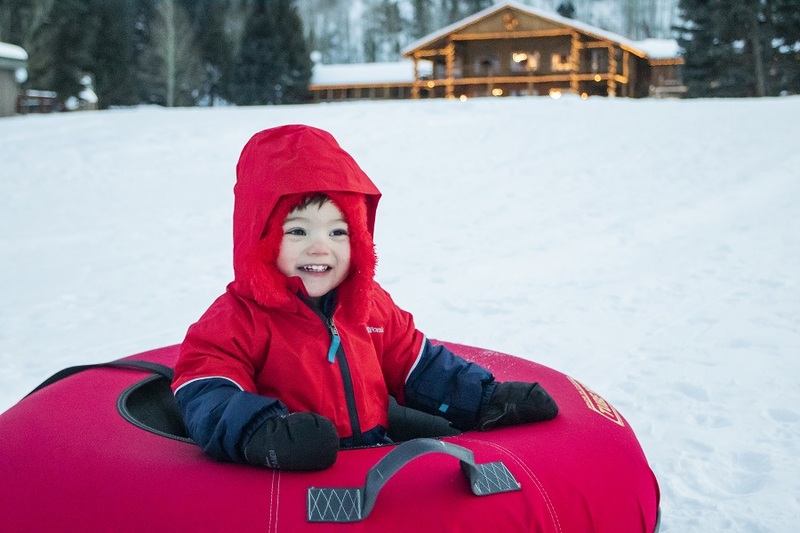 One of the most popular activities at the C Lazy U ranch every winter is tubing. Snow tubing in Colorado is a great activity for both adults and children, as it doesn’t require as much equipment as an activity like skiing. You can go out for an hour, or spend the whole afternoon going down and up the hill. Don’t have plans for President’s Day this year? Consider a trip to the ranch with the whole family! C Lazy U is offering a $100 booking credit* for our President’s Day weekend special which requires a two-night stay from Wednesday, February 13 until Friday, February 22, 2019. Since this special takes place around Valentine’s Day, the ranch will be providing a supervised kids program Friday through Monday so the adults can have a romantic dinner date away. We will be joined by the ever talented Denver based singer Hazel Miller as our headliner Saturday night. *$100 booking credit is only valid for new reservations. Can’t be combined with any other specials or offers. Credit is non-transferable. Only one credit per booking party. To qualify for the credit you must have a minimum of 2 people for 2 nights at the prevailing room rate. There’s nothing quite as special as going on a cozy sleigh ride with your partner. All winter long, C Lazy U offers sleigh rides to guests! Explore the ranch from a two-horse sleigh, and get up close with the other 200 horses on our property. This makes for an incredible group activity, as 12 people can go on the sleigh ride at once. It’s never too early to start planning your spring break vacation! Give your family a break they’ll never forget with our Family Spring Break Vacation special. The parents will enjoy the gourmet meals our award-winning chefs will serve up, and the kids will enjoy the animals around the ranch, along with the endless amount of activities in the snow. The family can start the day with a little skiing, then warm up in the hot tub or inside in our game room. Another reason why you should head to the ranch this chilly winter season is to relax and unwind in the Lazy You Spa. Our award-winning services will loosen you up after a long day on the slopes. For your convenience, we transform your cabin into your own spa, or you can reserve one of our tranquil winter spa rooms. Skiing in Colorado is like surfing in San Diego — it’s a must! Before the season ends, head on up to C Lazy U to take advantage of Colorado’s most beautiful ski trails, while also resting in luxurious cabins and eating chef-prepared meals. We partner with local ski resorts to help organize lift tickets and transportation to the mountain. Need a trip away with the girls? Yogini legend Cathy Woods is coming to C Lazy U for three-day Body, Mind, Equine™ Women’s Retreat. During this all-inclusive yoga event, horses and yoga will be combined to renew your mind, strengthen your body, and become a conscious rider. Whether you’re seasoned in riding and yoga or you’re completely new to both, this yoga retreat accommodates every woman. Learn more about C Lazy U’s Colorado winter activities. I just had the delightful experience of celebrating my birthday with 30 friends and family at C Lazy U ranch. Once again the service, food, activities and ambiance were exceptional. My husband and I said to each other that we could not imagine NOT returning every year. It truly is a treasured place for us.